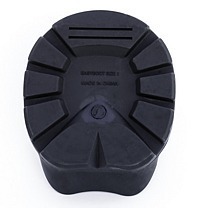 The Easyboot Glove is the Glue-on shell with a gaiter. 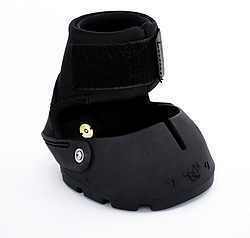 It is a very lightweight and flexible seamless boot that hugs the hoof and responds like a natural foot. No external hardware to fray or break. Glove "Soft" has the elastic Gaiter. Glove 2016 has the rubbery gaiter. The Easyboot Glove is the Glue-on shell with a gaiter. 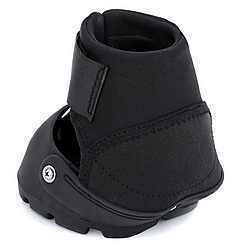 It is a very lightweight and flexible seamless boot that hugs the hoof and responds like a natural foot. It adds very little bulk or width to the hoof. No external hardware to fray or break. Fit should be very snug. Studs may be added for winter riding. I've found the boot stretches a bit with use, the optional Power Straps are recommended for use in hilly, muddy conditions, and for fast riding. Only the sizes in stock will display in the drop down list above. Please check with me to see when my next order will arrive, or to place a special order. The size chart is the same for the Glue-On and Gloves, these differ from the Easyboot/Epic size chart. Stablegear Tack does not keep boots larger than size 3 in stock. I do special orders by request.